I've been struggling quite a bit over the last few months with the town of Emsingen, especially the area I call old town, around the Rathaus (town hall). I wanted the Rathaus and the Rathausplatz (town hall square) to be a focal point, with several appropriate houses grouped around it. I wanted there to be a small farmers market, as well as some depth to the arrangement overall. If you look closely at the Emsingen posts on this blog, you'll notice how the arrangements have changed over the course of the last 15 months. As I built the town foundation having settled on an arrangement for "new town" I was still unsure whether "old town" will work. I was bothered by the area the houses are set on, and the open space before the Rathaus. I didn't know how to arrange the market stalls. I had been toying with using the small fountain somehow to provide a boundary, but didn't know where I was going with that. I built the sidewalks for "new town" today, which created a very pleasing feel to the arrangement. As I sipped on some Gluehwein tonight meditating over the setup, I realized that what's missing is structure to the Rathausplatz area and a clear separation of street and pedestrian areas. I settled that streets in old town would be fairly narrow, and -- where I could get away with it due to sight lines -- impossibly narrow to save space and create depth. There would be a narrow street in front of the Rathaus, which creates pressure for the farmers market to squeeze into a smallish space. I built only three stalls, so the need to fit into a small space works to my advantage. A village detailing set (yeah, that is from Faller, too) provided a string of stone railings to define the other side of the market area. 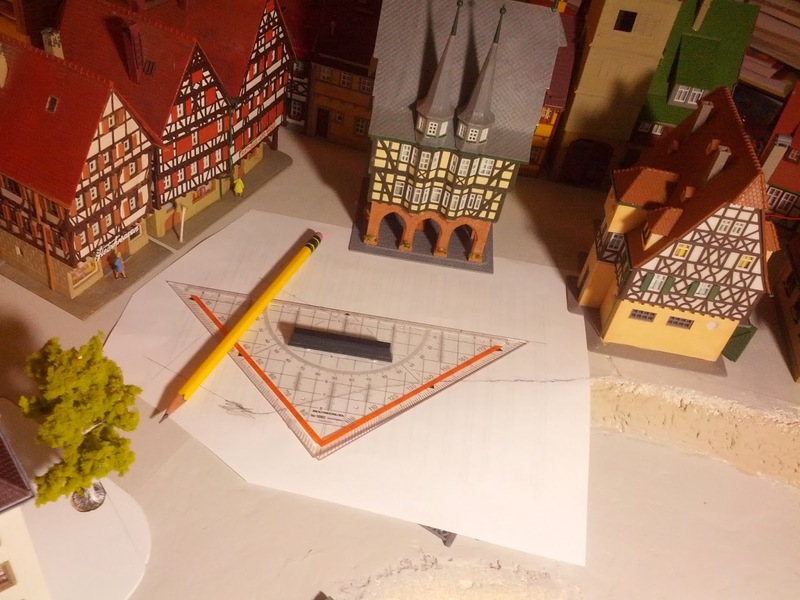 I made a paper template of Rathausplatz (in fact, I made more than one as I tried out alternatives), defined the street and the market area, where the fountain goes, and ... things started to come together. As I photographed the farmers market, it became clear that the streets in old town need to be cobblestone. Now the question is: Am I going to make cobblestone streets myself, use my precious Auhagen roman cobblestone that is intended for Talheim in a far away corner that is barely visible, or find regular cobblestone sheets locally? The new part of town is getting sidewalks. 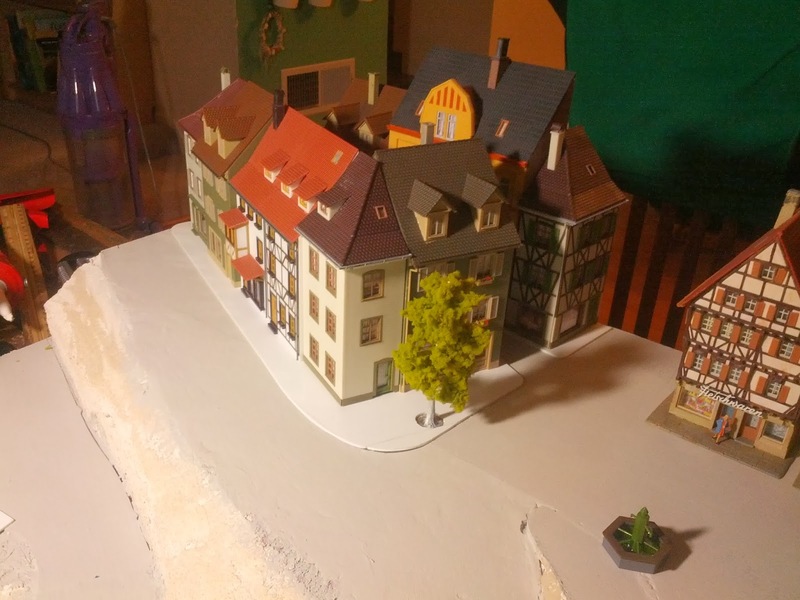 I moved the whole town module to the "art table" in the living room that serves as my workbench during the holidays. 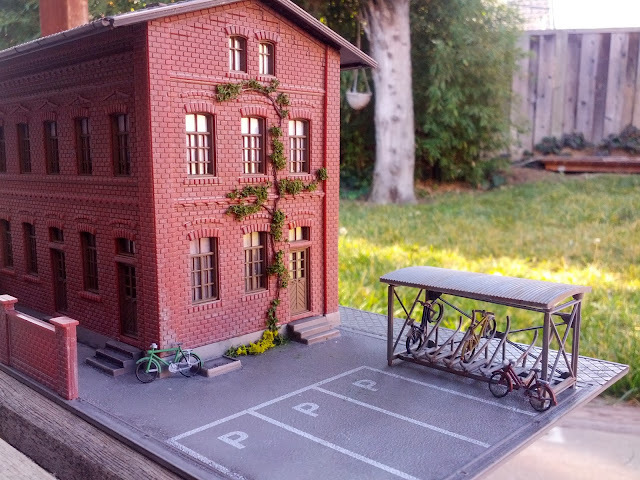 I figured that a typical city sidewalk is about 10cm high, which works out to about 1.15mm. I have 1/16" styrene sheet at hand, which is 1.5mm. Close enough. I also cross-checked with the houses that have attached sidewalks, like the one on the right. Those are the same height, give or take a a couple tens of a millimeter, i.e. indistinguishable to the naked eye at normal viewing distances. One hour later, everything is shaped and glued down. I'm quite happy with how this is coming together. ... Oh, just realized I didn't paint or detail the sidewalks before gluing them down. That might be interesting. I'm itching to get back to working on the town of Emsingen, so I'm leaving the Timesaver in the stable, operational state it is in right now. Here's what the Timesaver looks like at this time. 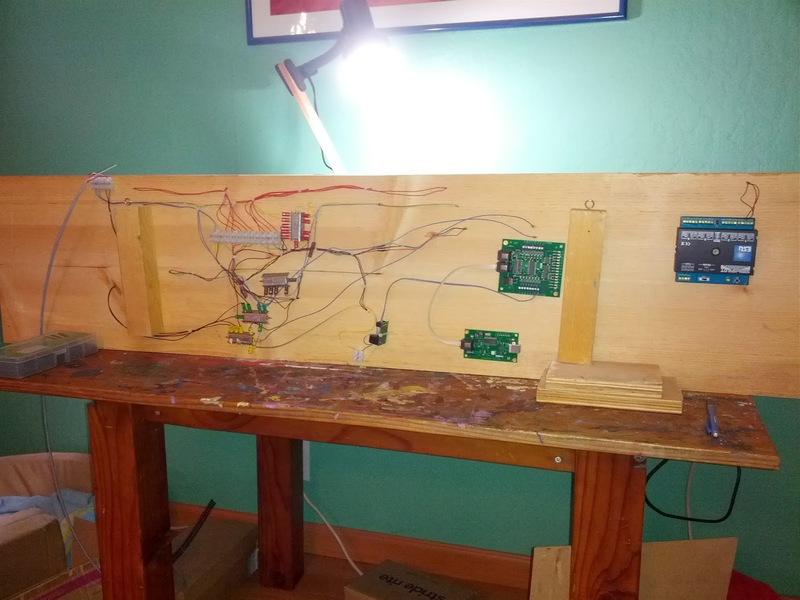 Up until now I kept the electronics (USB interface, AIU, BD20) loosely connected in a cardboard box near the Timesaver. Now everything is neatly tucked away under the layout. I'm also using a longer multi-cable for 16V AC and track power, so the NCE faceplate doesn't need to sit in a somewhat awkward corner under the layout board. The Switchpilot is intended for computer control of the lone turnout in the corner. We'll see how well that works out. 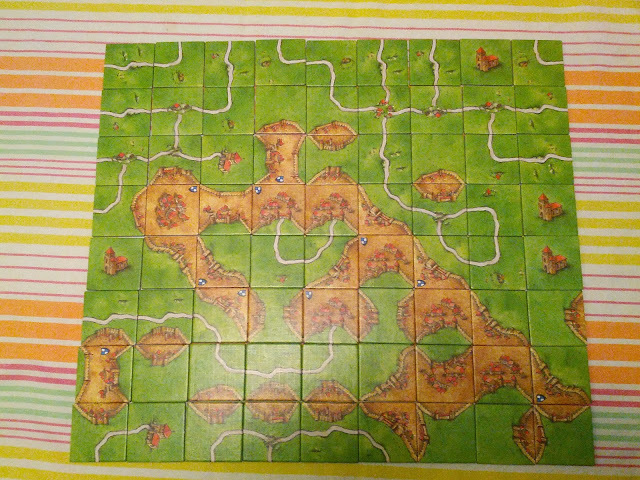 I had so much trouble with these units on my home layout that I don't quite trust it yet. The underside of the layout looks a bit more complicated than it really needs to be. I went a little bit overboard when I wired the turnout switches a couple years ago. I added extra feeders, including the drops for the new detection zones. Left to do is wire up the second BD20 and test the Switchpilot. I started ballasting track yesterday, and finished up that mess today. 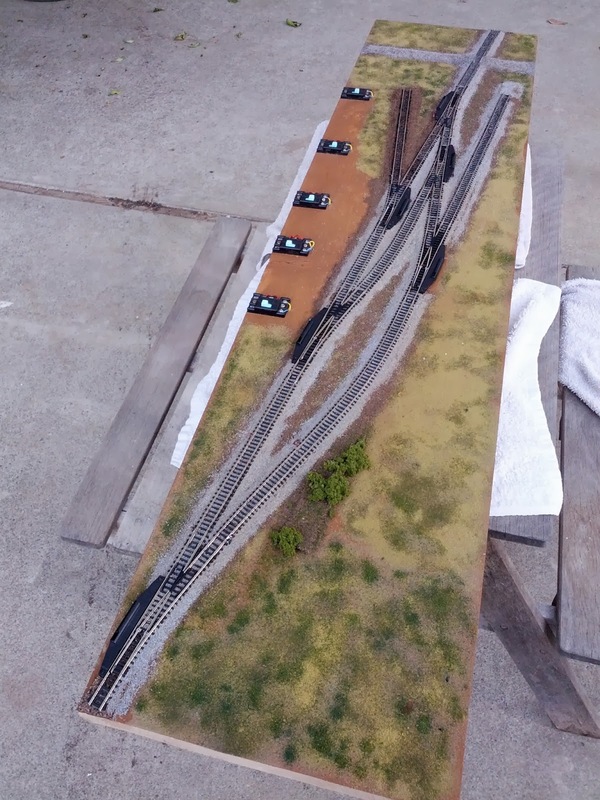 Ballasting can be a meditative experience, but today I just wasn't in the mood, and messed up the half-glued, carefully shaped ballast more than once. It didn't help that the glue didn't want to cooperate today, ... or maybe I was just too impatient. The unmodified half of the Timesaver is ballasted, and the other half has the new track installed. Now the glue gets to dry until tomorrow. What's the point of the turnout in the far corner of the segment you ask? - In the office it connects to track that runs across and around my desk. Take a look at the video. 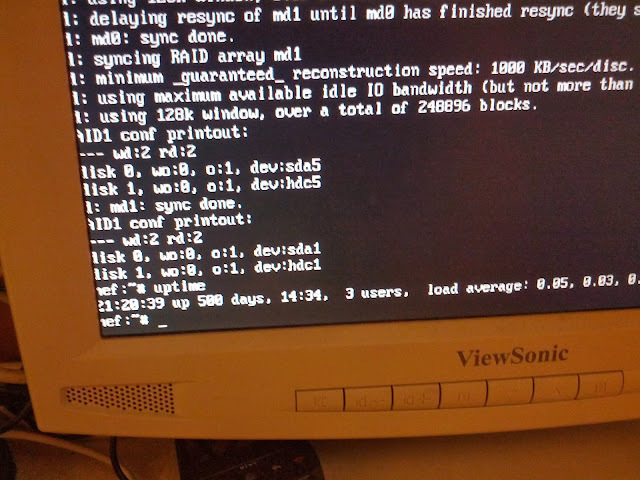 The office layout supports automated running. 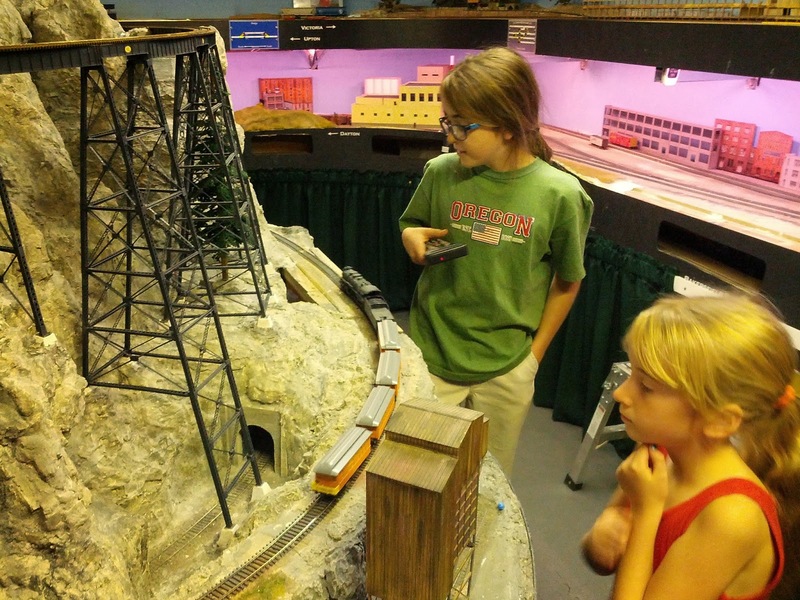 I want to be able to have two trains take turns on the single track section. That requires slight changes to the Timesaver side of the track. 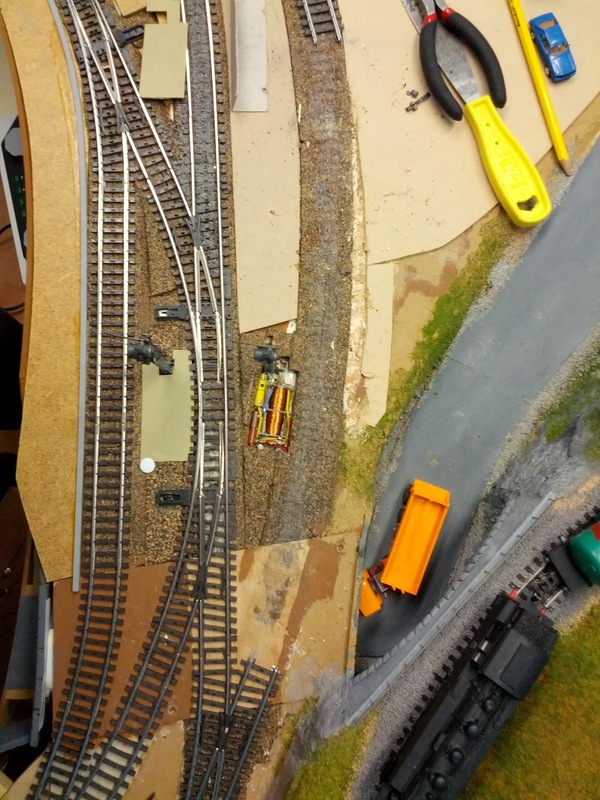 While at it, I'm fixing up minor issues with the existing tracks. Most replacement tracks are cut and the extra roadbed is glued down. Over the last couple days I finished up the foundation for Emsingen. 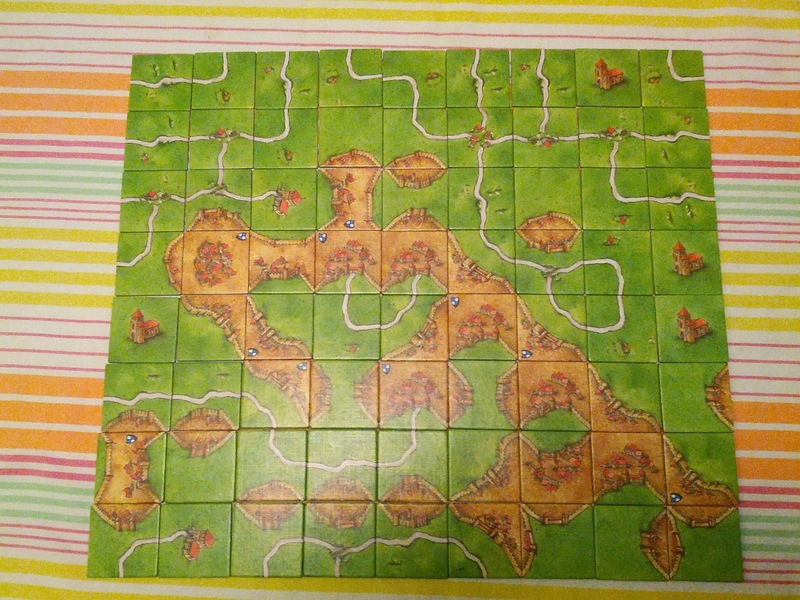 Getting a smooth road on this somewhat tricky arrangement using a spatula is ... challenging. 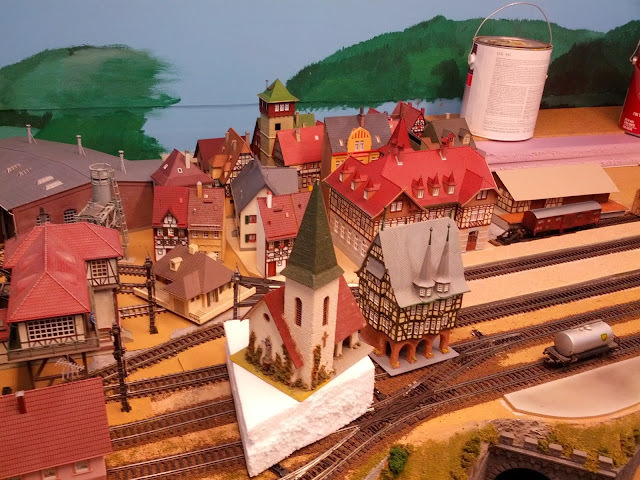 When the flatter area at the bottom didn't really work out at all, I fell back on Joe Fugate's "building a smooth road with styrene is way too easy" recommendation. It worked out quite well. 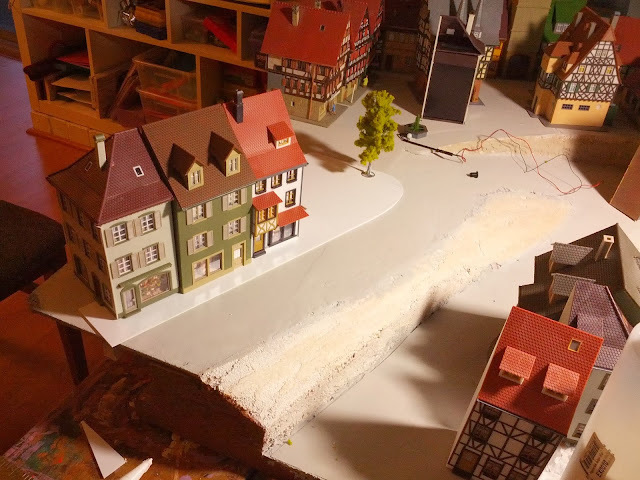 The road surface is too light at the moment, but I'm planning to fix this with some weathering using a light wash and weathering powder when I blend together roads, side-walks, and building base plates. Emsingen town foundation. Roads are done and painted. 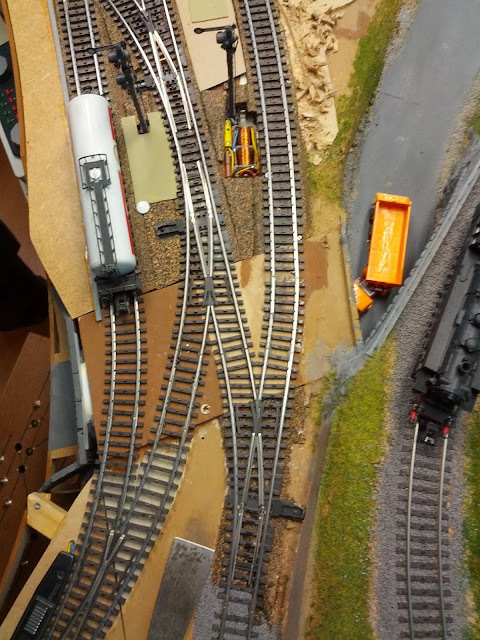 When I test-fit the freight shed on the patio yesterday it appeared that the corner of the shed extends onto the access road to the train station. Thus, I ended up taking the whole thing inside for a test setup. It turned out that everything still fits together. It's tight, but workable. I might shorten the loading ramp on the street side a little bit once I get to building the station area. Removable section of Emsingen set in place and populated with buildings. 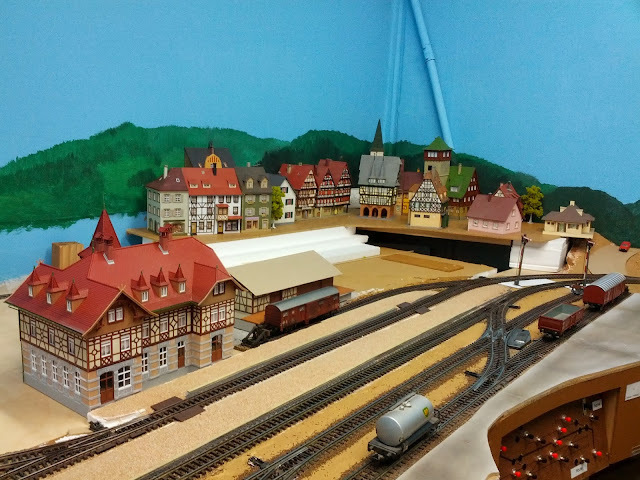 Freight shed and Bahnhofstrasse are really tight. Need overgrown wall below the houses behind the freight shed. Rocks under Marktplatz need to match color behind Steinle. Somewhat step dip towards the grade crossing is needed. I should have rasped down the street an additional 2mm or so towards the edge. Arranging backyard / garden on the right hand-side in above photo so that the gap will mostly disappear will be difficult. That's actually true for all the gaps. 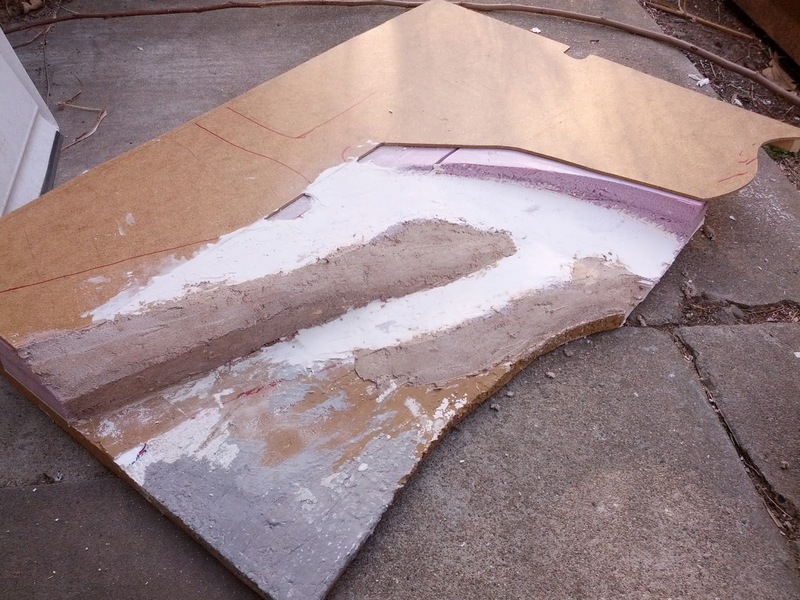 I might experiment with thin styrene "flaps" to cover the gaps at least for the streets. Keeping the whole thing removable and not damaging the foundation or buildings in the process requires some kind of hidden lift-out / lift-in help once scenery is completely built. I'm not sure yet how to do that. Maybe string loops hidden behind houses on the left and right? The next removable section will not be this big. Finally, an overview shot of the setup as seen from the Talheim operator position. Emsingen Lokstation, station, and town. Obviously I need to finalize the backdrop. 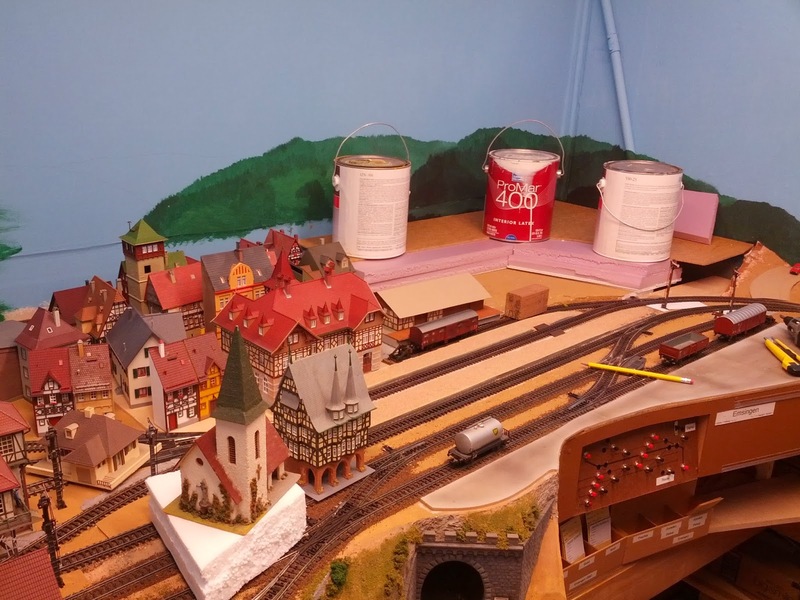 I plan on completing installation and wiring of lights for the town of Emsingen before I go back to work in January, and maybe even finish basic detailing. Then I'll move back to the engine servicing area, fix the turntable, detail the roundhouse (including a mechanism to open and close doors). 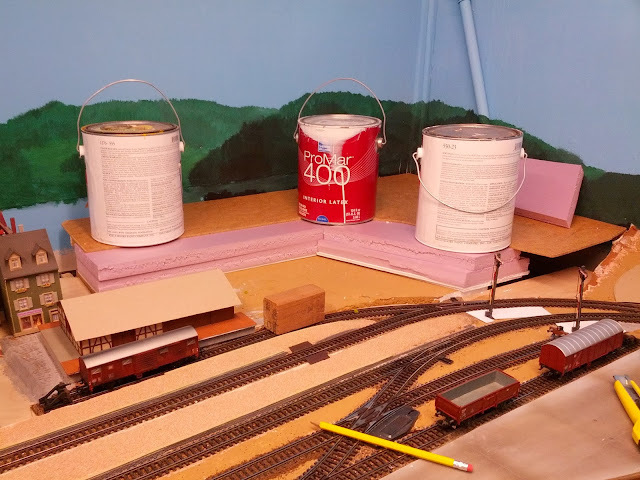 Once that's out of the way, I can blend together the two areas, and complete work on the main station area, both street-side and track-side. It'll probably be May or June by the time I'm done with that. Today I'm taking a break from Emsingen, and work on the N-scale Timesaver instead. Sprucing up an otherwise somewhat boring brick building. Now that the base of Emsingen is glued together, it's time to go full out on terra-forming. I'm using various instruments, but the dry-wall saw and a basket rasp proved to be the most effective. 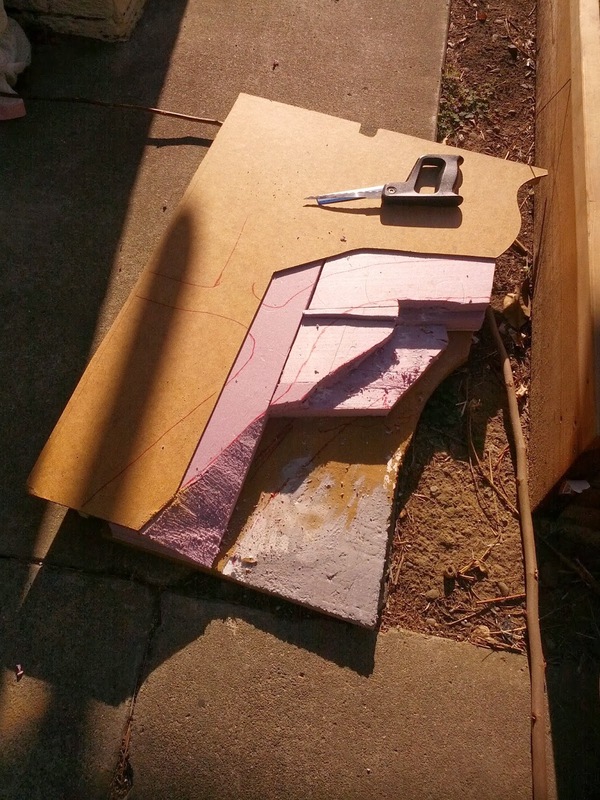 Cutting pink foam is not nearly as messy as cutting styro-foam. Rough street outlines are drawn in the areas to be terra-formed. Contours are in. One can see where the main road is going to come down to the crossing, as well as the turnoff to the station. Shaping outside with the shop vac running keeps the mess to a minimum. Time to even out the road surface. 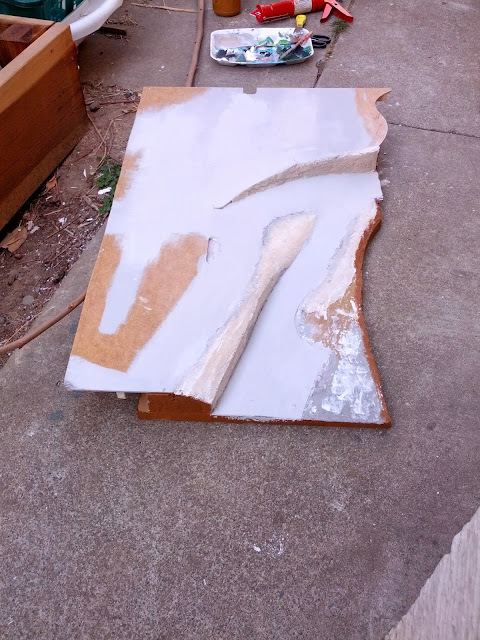 I used spackle paste, but I should have done a first rough coat with Scuptamold or the plaster/vermiculite mix. Scenery contours going in. I use a plaster/vermiculite mix for this. Hey look! It's me at the Silicon Valley Lines Open House in November. Behind me are Nowheres Yard on the left and the hump yard on the right. Matthew is running a long coal unit train past Jacksonville through Igo. Photo credits Robert Lombardi. When Robert sent me his photos, I realized I had taken a few with my cell phone as well. 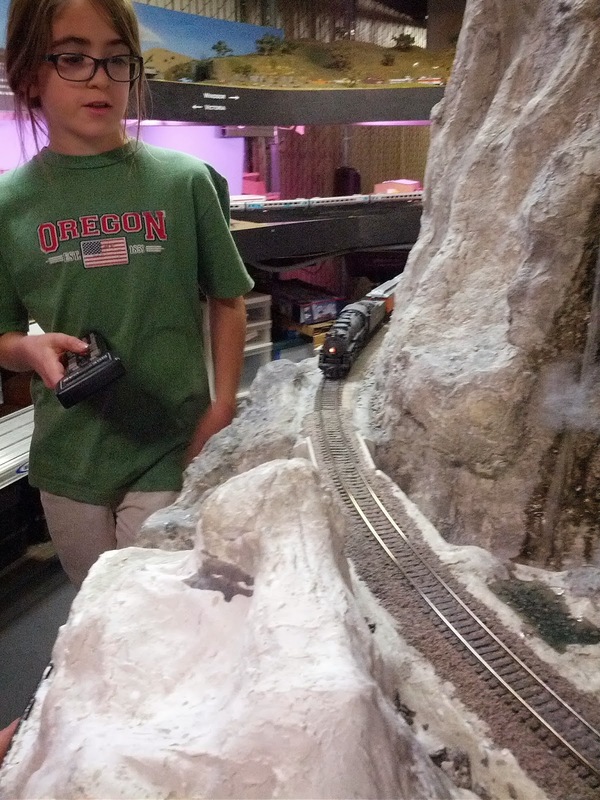 Engineer Pascal and Conductor Franziska running the Passenger Special past the high bridge at Mt. Nichols. At the end of the day, always the best thing is to have fun with friends. ... since the last reboot. Every Tuesday and Friday, there's a small farmer's market on the Rathausplatz in Emsingen. It's very popular with the locals, since they have local, organic fruit and vegetables, as well as liquors and wine. When I wasn't racing Go-karts this week, I built the market booths, and detailed their offerings. 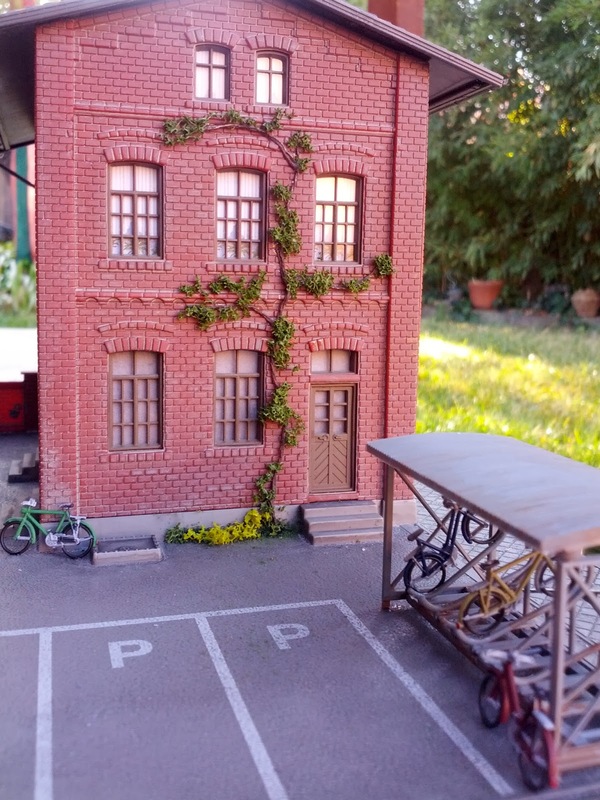 I took the photo outside in bright sunlight on a temporary diorama. What are all these houses doing on the tracks? Looks like the whole town moved! It's time to close the opening under the town hall square ("Rathausplatz") and rough in main street down to the station and the track crossing. 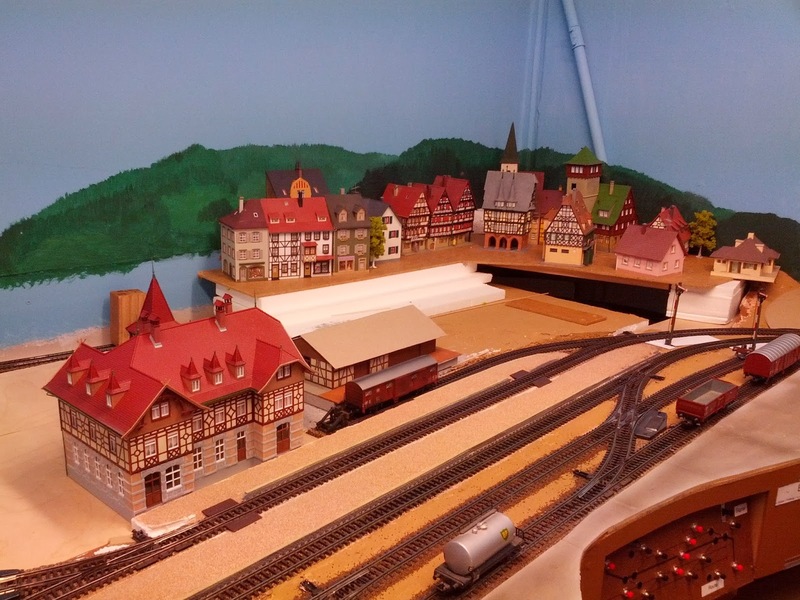 The trick here is that the whole town -- all the way down to the freight shed -- will remain removable. Thus in order to avoid a multitude of visible cuts, I'm building one large piece by gluing pink foam sheets between the hardboard supporting the town and the styrofoam piece where the freight shed is located. 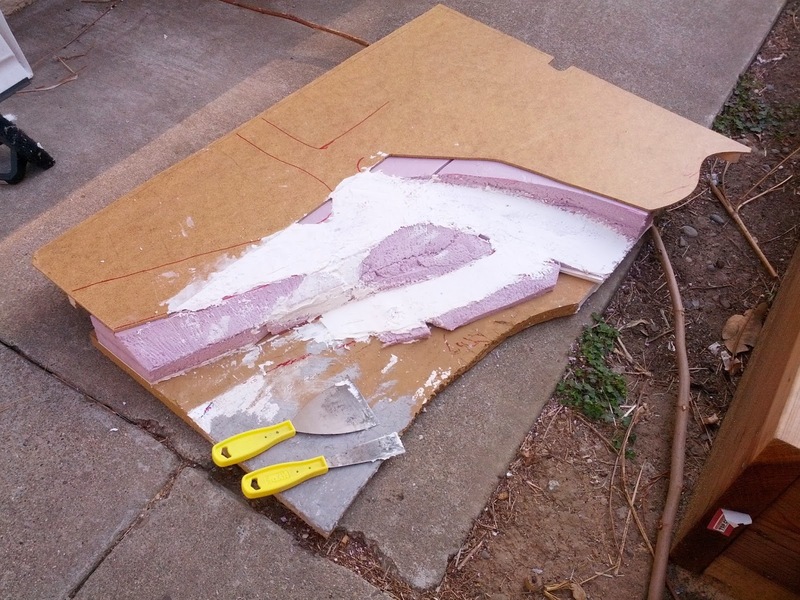 This way I can lift out the whole section, and do the messy land form sculpting in the backyard next week. 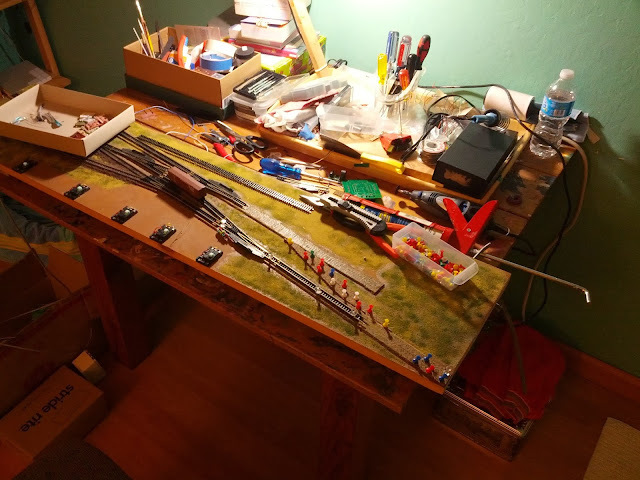 In addition I can build streets and squares for the town, wire and detail everything at the workbench. 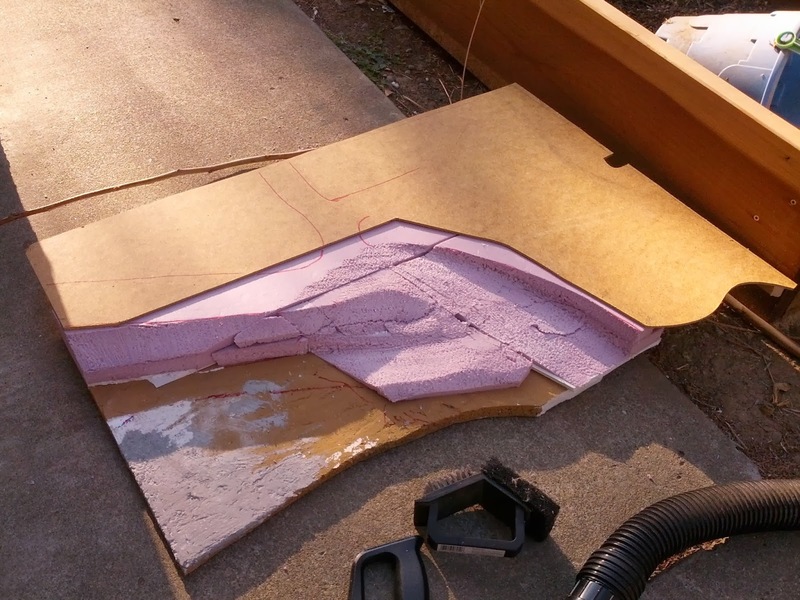 I've never worked with pink foam before, but already am finding it far superior to styrofoam. I'm using DAP Dynaflex 230 silicon caulk to glue the various layers together. There's some foamboard in there as well to get a tight fit. 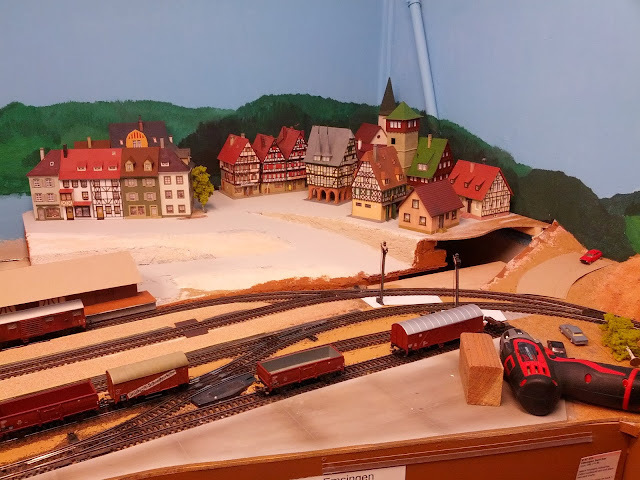 As part of a bet that I wasn't quite aware of, a co-worker got me "something for your trains", and since it was work, he wanted me to pick an engine for the office layout. Here it is. 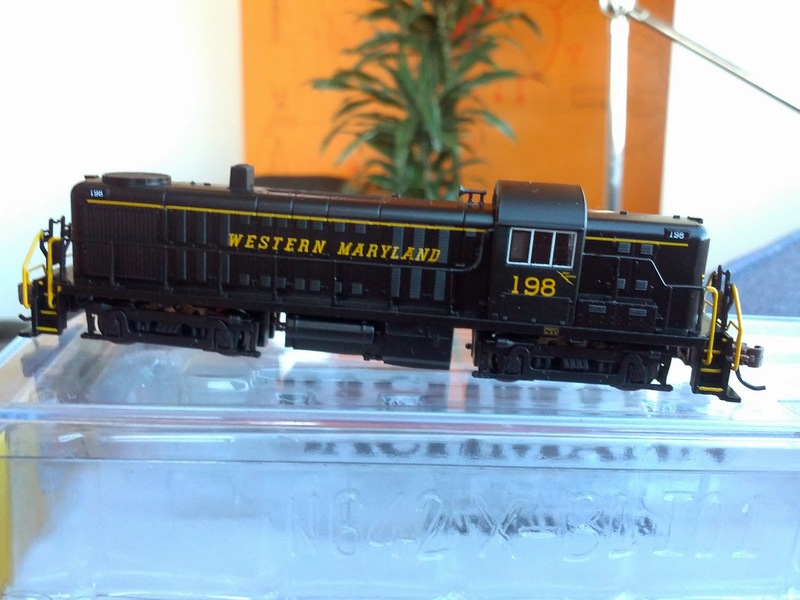 This is a basic run-of-the-mill Bachmann unit, DCC included. It does need a little bit work as the pickups loose contact in left curves. However, it navigates right curves just fine. I suspect some tab looses contact as the trucks swivel and needs to be adjusted a little bit. Looks like we're finally going to get some rain tonight. 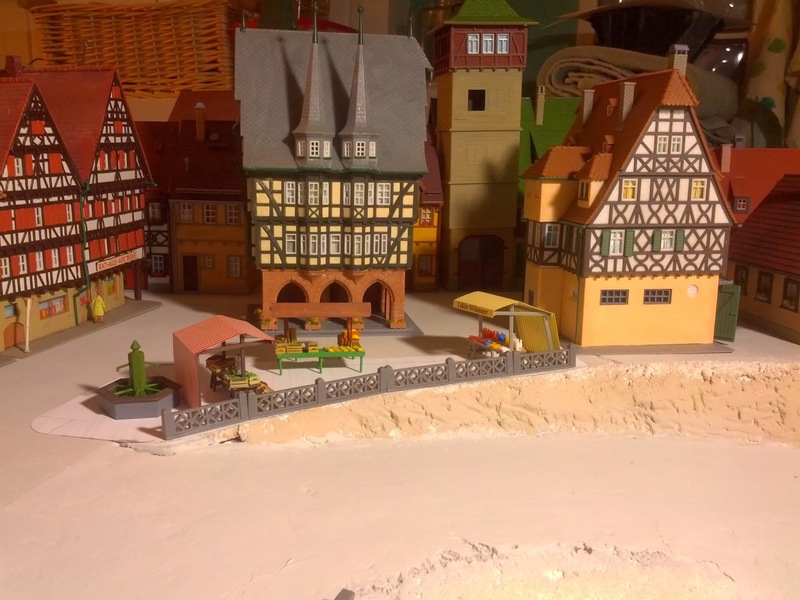 Over the last week I built a bunch of houses for the town of Emsingen. The corner is getting busy. Different angle looking up from where the main street is eventually going to cross the tracks. Most houses in the new block are relief buildings, so only the front fassade and the roof facing the street are present, while the rear is missing. The only exception are the green house to the right of the tree, as well as the corner house on the left. These are all built from Faller's 130430 "Relief Houses" kit. I modified the kits only slightly, and applied some gentle weathering. More weathering and patina is needed. 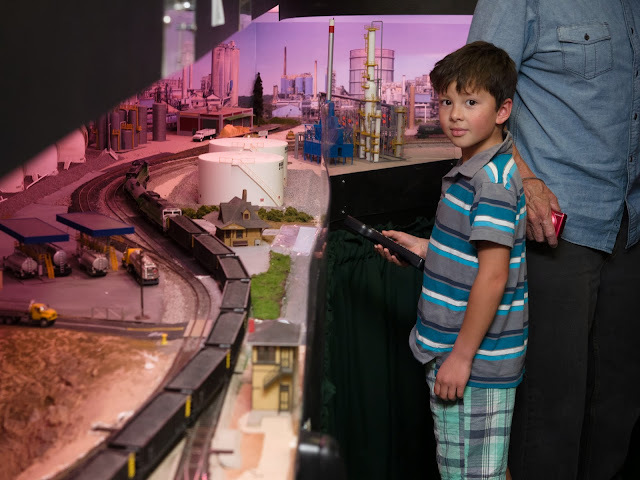 In the beginning the layout room was lighted by a torchiere with 300W ceiling flood light. Then I installed a single ceiling mounted fixture with 3 spot lights with daylight CFLs (7000 Kelvin). That worked ok, but was not satisfying either, since I was looking for a more consistent lighting across the whole layout. During our kitchen renovation I moved a set of fluorescent tube mounts into the layout room and installed Cool White (4000K) tubes based on the recommendations from Tony Koester's books. 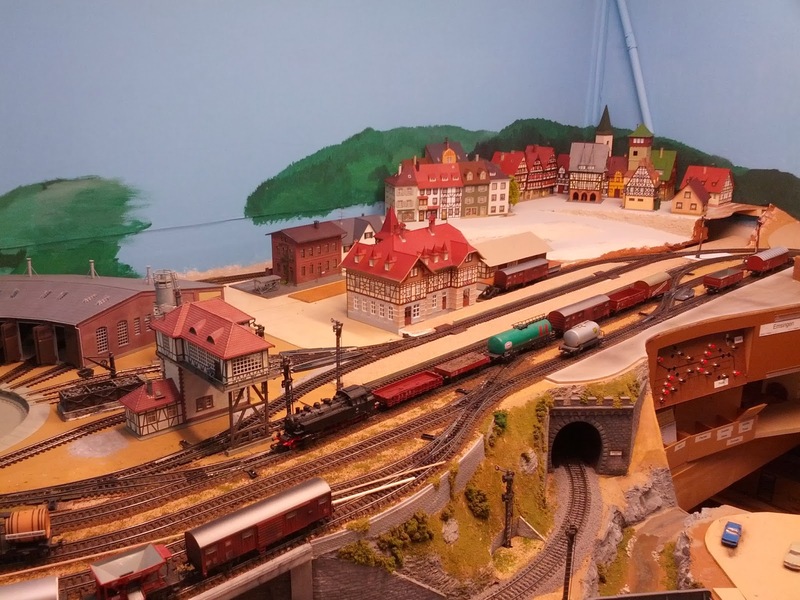 However, I found that the scenery felt flat in comparison to the daylight CFLs, so I picked up a 7000K tubes at Home Depot and lighted the room with that. Wow! It felt like daylight coming out of the middle of the garage, and in the first couple days I thought I left the side-door open whenever I went into the garage. However, 7000K is a quite blue-ish light, which really brings out even tiny hints of blue in scenery colors. 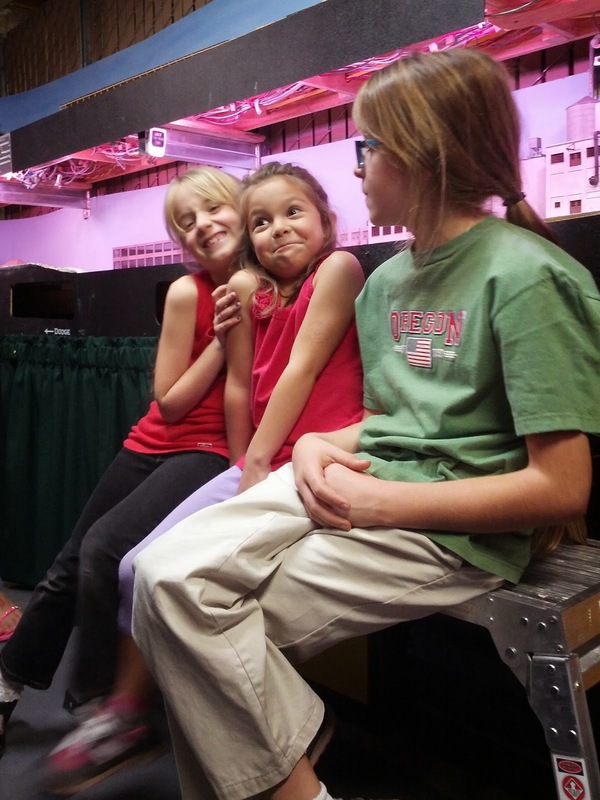 As I built up scenery I became increasingly unhappy with the color temperature in the room. The ballast has hues of blue-ish gray. The rocks are a little bit blue. I tried to compensate by not using brilliant white to make grey tones, as well as mix in some brown color as well. Still, it didn't quite work, and I increasingly got the feeling that the layout looks sterile. One really neat thing is that I can take digital photos with the white balance set to sunlight and the color in the pictures captures the look just perfectly. So, 7000K is great for photography. But not so good when actually being there. Today I went the other extreme and replaced the 7000K tubes with 3000K warm-white tubes. Those are meant for kitchen & bath applications because they produce warm hues. And yes, the room feels much more friendly. Especially grayish colors are not as aggressive anymore. Sunlight doesn't work at all. Setting the white balance to fluorescent is better, but the photos are still not great. I'm starting to see an arrangement emerge for the left side of Emsingen that feels complete, and leaves room for the track to emerge from behind scenery. This is the well-known Kibri kit of "Stellwerk Marbach". The kit has been produced since 1961 (!) and production stopped only recently, so it's still widely available in stores and online. 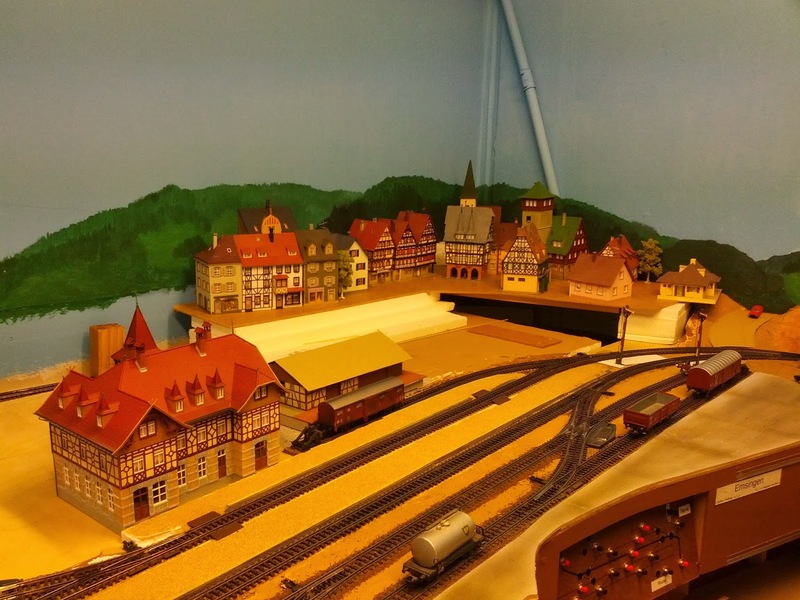 My Dad had it on our layout in Germany and it was among the buildings I rescued before taking the layout apart. The building was in somewhat sorry state (here's a picture from last year), and badly needed a refresh. Brick and wood parts were painted and I made signs. The whole building got a do-over with Bragdon powder paints. 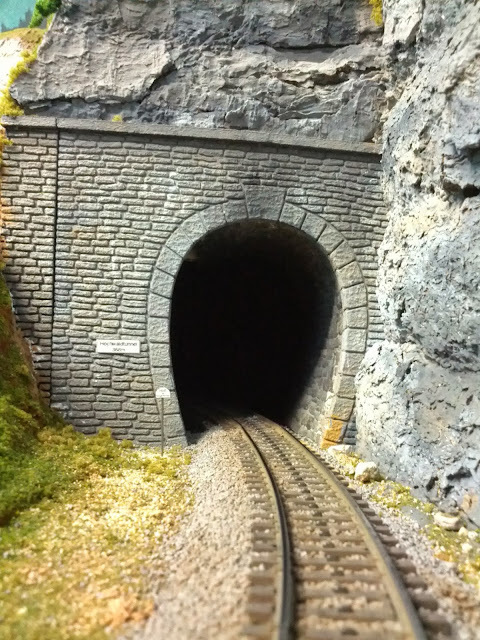 I also cut off the plastic lamp imitations, and replaced the one above the stairs with an N-scale Miniatronics 1.5V lamp with shade. Given how old the kit is, I'm quite pleased with this refresh. So, ... did this trip live up to my expectations? I wrote about scenery and people already. Let's take a look at the Amtrak side. The food on the train definitely exceeded my expectations. Everything I had tasted good and was prepared nicely. The green side-salad at lunch could have been a bit fresher, but that's really a minor issue. It stood out because it didn't live up to the level of the other food. Breakfast was omelette with veggies and cheese, roast potatoes, croissant, coffee, and some fruit. Lunch was Kung Pao stir fry over rice with a side salad, and a roll. Splashed down with Sierra Mist. Dinner was a lamb chank with rice and string beans, also with a side salad and a roll. Accompanied by Sierra Nevada Pale Ale. I had booked a private Roomette Sleeper compartment. The two seats convert to the lower bunk at night. A second bunk folds down from the ceiling if needed. The length of the lower bunk was perfectly adequate for my 6 ft 5 in. As mentioned in a previous post, it takes some getting used to to sleep in a moving train. The train was more or less on-time pretty much for the whole distance from San Jose to Eugene, but got into Portland 35 minutes late due to track work, and then we got stuck for another 30 minutes waiting for an opposing Cascades train on a single track segment just north of Vancouver, WA. Arguably, the track work gummed things up for us. According to amtrak.com we're estimated to arrive in Seattle 15 minutes late. Amtrak personnel on the train was super-nice throughout the trip. 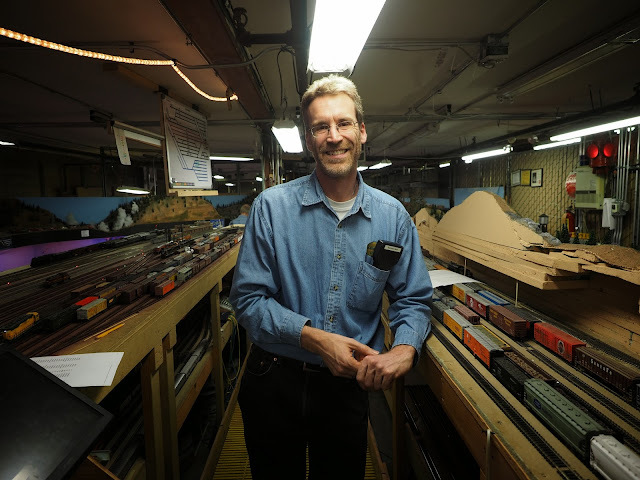 The sleeper car attendant, the waiters in the dining car, and in the Pacific Parlor car were very friendly and helpful. The staff kept passengers well-informed with announcements. For the trip over Cascade Summit from Klamath Falls to Eugene, a docent was riding in the observation car and talked about history, geology, railroading, and other tidbits related to the area. There is WiFi Internet connectivity in the parlor car, but the access point was quite inconsistent, and I didn't bother much, relying instead on tethering to my mobile phone data plan. Data service was pretty good while I was awake with exception of the 3 hour section through the Cascade Range. I spent --- somewhat to my surprise --- most of my time in a swivel cushioned chair in the parlor car. While the observation car was newer and had clearer windows, the seat setup was not as convenient and comfortable. The privacy of my Roomette has something for it, but I really enjoyed the atmosphere and all-around views from the parlor car. So, overall I had a lot of fun, got work done, had good food and drink, and very much enjoyed this alternate way of travel. However, I will take the plane for the return trip. 24 hours on a train twice in one week is a little bit much. Even for me. Maybe the State of California will get its act together and indeed build a true high-speed rail connection between San Francisco and Los Angeles, depsite all the nay sayers in the Central Valley and the Peninsula. SF to LA in under 3 hours ... I'd certainly use it if such a thing existed. Yup, the time penalty is impressive. I'm on the train for 24 hours to get from San Jose to Seattle. This is not a trip you take if you are in a hurry, or want to travel cheap. The respective 2 hour air-plane ride costs quite a bit less than the sleeper accommodation on the train, and is significantly faster. Even taking a car is faster. Either way, this is not the point. I like this mode of travel. It's a lot more relaxing than driving, and significantly more friendly than flying with all its security madness. I saw some stunning scenery today as we crossed the Cascades between Klamath Falls and Eugene. I got work done. And I had nice chats, good food, and drinks. What else can you ask for? As I'm writing this dinner reservations are made. It's raining since we got into Willamette Valley. 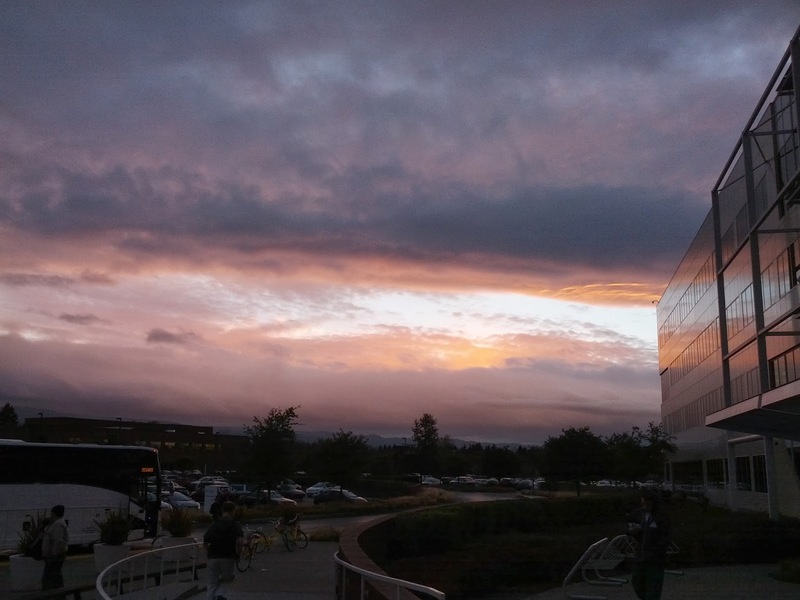 Welcome to the Pacific North-West. We're rolling into Portland and are about 39 minutes late, yet arrival time for Seattle is still estimated to be 50 minutes early. It took me a while to fall asleep last night. That half-cup of coffee after the beer probably didn't help. The shaking and rolling of the car as it makes its way over the fairly worn out Union Pacific tracks towards Sacramento took some time to get used to. The bed is a bit short, but more comfortable than I expected. I didn't have high expectations, so this was a pleasant surprise, though don't expect memory foam goodness here … Nevertheless, eventually the car rocks you to sleep. I slept for 7 hours with a couple interruptions twisting and turning. Overall, about as good as I hoped for. When I woke up this morning I could see Mount Shasta in the distance behind the train. We're crossing into Oregon to a beautiful sunrise. I got dressed, took photos, and went to the dining car for breakfast. Amtrak has this interesting policy to fill up the tables in the dining car as they seat you, so you sit with three strangers and get to do conversation. As it turns out the guy across from me was stationed in Ludwigsburg for 3 years. First time ever I met an American who served in my home city, so we had a nice chat. I finally did it. A work function in Seattle required my attendance, and I booked the trip to Seattle on Amtrak's "Coast Starlight". There was quite some mixed information I could find on the Internet. Some people wrote about the horrible delays. Some people wrote about their experiences with sleeping car accommodations and attendants. I really enjoy traveling by train, having done so multiple times in Germany. Nevertheless, I never took a long-distance train in the US, and was always curious about the experience. Here we go. While writing this I'm sitting in the Willamette Parlour Car, and the train is slowly making its way through northern Santa Clara while I'm sipping on a Sierra Nevada. Finally, an opposing train clears the single track across the Bay towards Newark, and we're picking up speed. I was quite excited when Patricia and the kids dropped me off at Diridon station. In fact, yes, I was nervous. I'm going to be on this train for the next 24 hours, and I really don't quite know what to expect. What people are going to be there? What about the staff? What about amenities? Do they have snacks? My bed for the night. The train arrived on time at San Jose. I boarded Sleeper car 1432, and the very friendly attendant directed me to another room than the one on the reservation, since that one was just vacated by passengers leaving the train in San Jose. "Room 7 is all set up for you and ready to go". Whatever, I don't mind. I dropped my bag in the Roomette. It's basically a two seat compartment that converts to two bunk beds. Not super roomy, but perfectly adequate private accomodations for a single traveler. I took a stroll towards the dining car to orient myself. I notice hot water (coffee?) and fresh apples in every sleeper car. It appears the sleeper cars are coupled at the head-end of the train, while regular seating cars are in the rear. I opted to skip dinner since I already ate at home. The menu looks promising. There seems to be a good mix of passengers on the train. Most of the younger people headed towards the rear of the train in San Jose, while I went with the more settled folks toward the front. The train -- and especially the dining cars -- is surprisingly non-crowded, though I think this is primarily due to my travel date in the middle of November. How much I love school projects. This one was particular father-son fun. Planet diameters are scaled 1000km to 1mm. 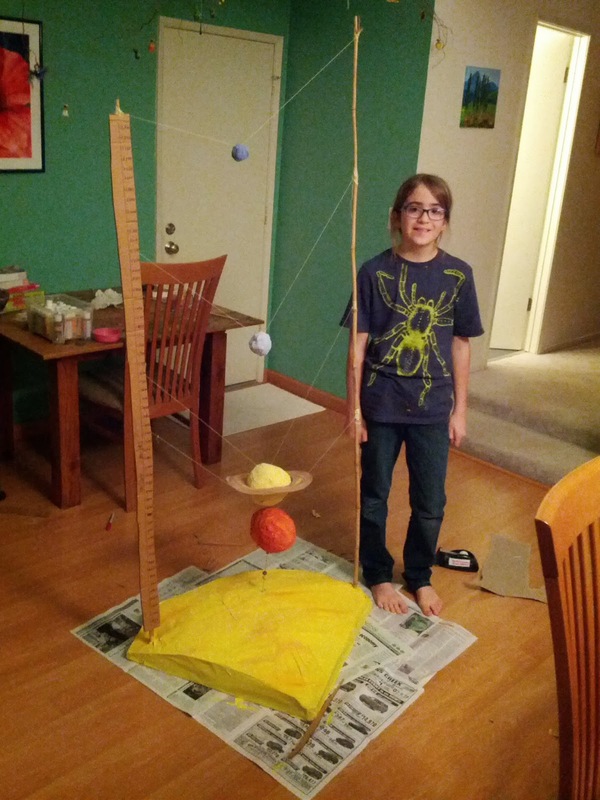 Pascal chose this scale since he already had made a "Neptune" from crumbled up masking tape. Planet distances are scaled 50M miles to 1 inch, because we needed to fit 3000M miles into the 60 inches we had available with the bamboo sticks. The funny scales worked out to some ... congestion ... for the inner solar system. The sun's diameter ends up being140 cm, so we skipped building the whole thing, and instead constructed a segment of the sun using hot glued cardboard strips, covered with painted masking tape. Radius of the surface is still correct with about 70 cm. Mercury is half an inch away from the surface of the sun. Venus and Earth are about 1.3 and 1.8 inches away, with Mars at 2.9 inches. Jupiter and Saturn are nearby, while Uranus and Neptune are appropriately far away. "Wow, Papa, the solar system is really big." -- He understood the lesson. By the way, Pascal made the choices what to build and how. 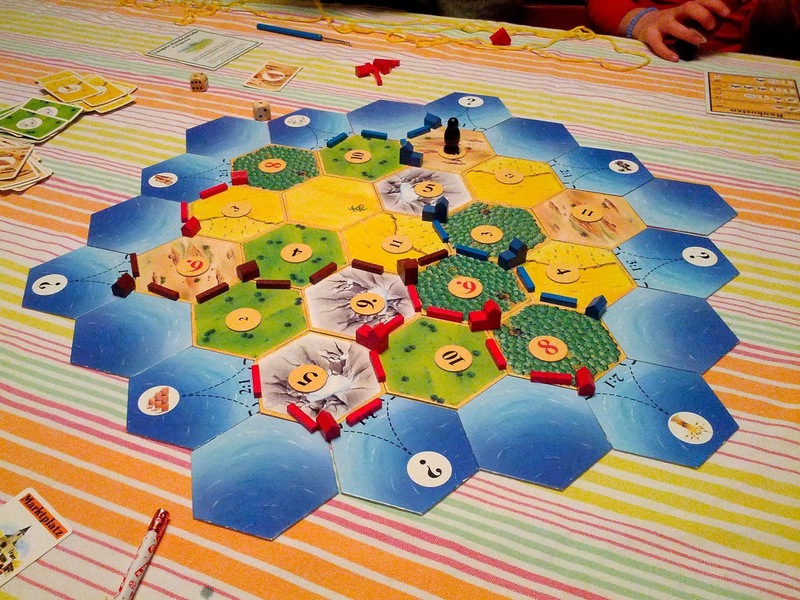 I helped with logistics e.g. using the big drill to build "shoes" for the bamboo sticks, or showing Pascal how to construct a sun from cardboard strips, hot glue, and masking tape. The entrance to Hochwaldtunnel, just north of Talheim station. Notice the signage that says all switching moves need to stop before the tunnel. I need to add more bushes and other greenery to this area. What's wrong with Talheim's Track 1, you ask? 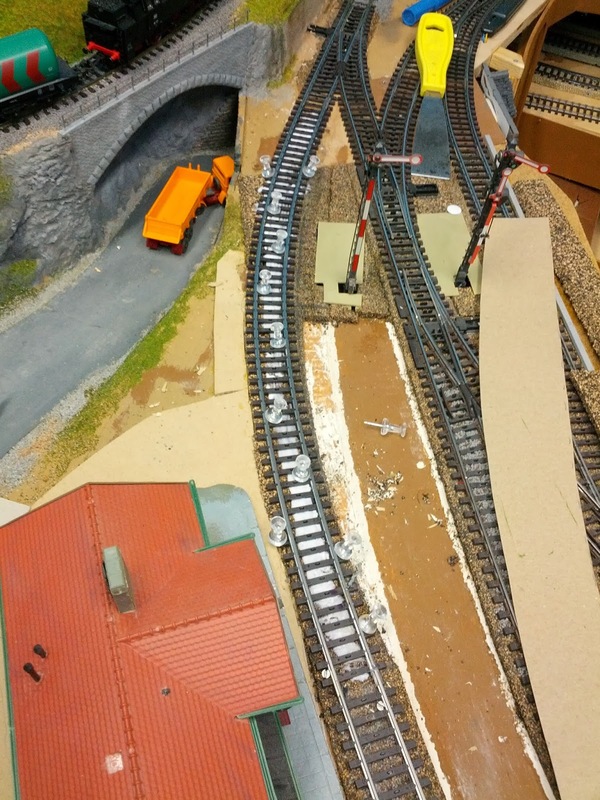 Talheim was my first foray into laying track using flex track. Not only did I learn a few lessons with that, but it was also the very first station on the layout and was set in place when pretty much nothing else existed beyond staging. Fast forward a couple years, while I was building the return loop around Steinle it turned out that I needed an additional inch of space for the loop, so I switched the north right-hand turnout to a left-hand turnout and arranged the curve to Hochwaldtunnel slightly differently. Since I didn't want to re-lay the flextrack in Talheim, I ended up installing a small curved bit of track that fixed up the geometry. I also never cut the gaps in the flex track to make Track 1 detected in two blocks as I originally had planned, because there's too much pressure on the rails that would develop into kinks. Yes, Track 2 has one of those and it isn't even bent as tightly as Track 1. For the next couple years I cringed every time a train was passing through this section. The track doesn't flow well. What's the point of flex track if you mess up the geometry like this? However, I couldn't get myself to fix it. It just bugged me, and was one of the reasons why I didn't ballast Talheim yet. 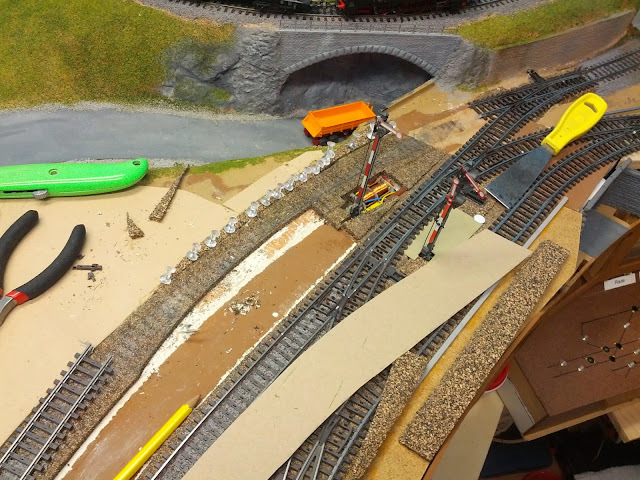 Yesterday I decided to make this right, found a piece of the flextrack in the right length, and cut out half of the existing track on Track 1. 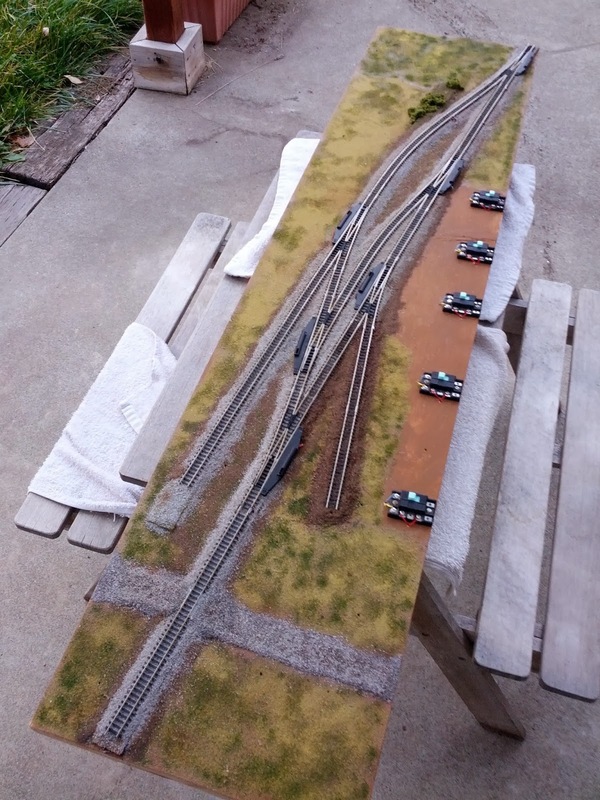 I didn't want to mess with the soldered bits across the bridge, and the track on the south side of the station is fine. 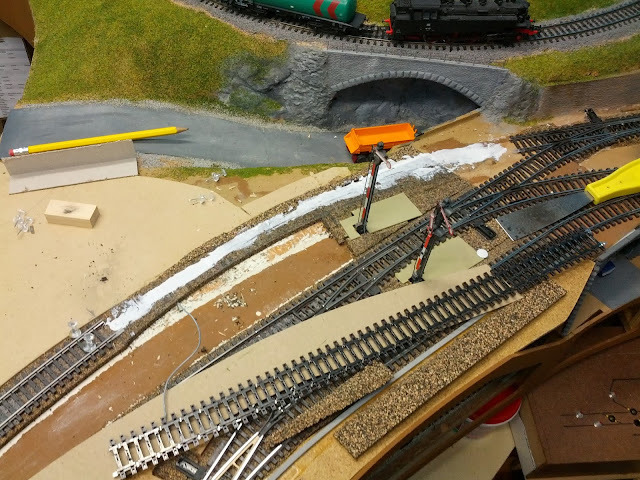 To get a nice curve with the new flex track, I needed to pad the roadbed on the outside of the curve a bit, as well as remove some roadbed on the inside of the curve. A nice side effect of that is that the platform for Track 2 will be a little bit wider. 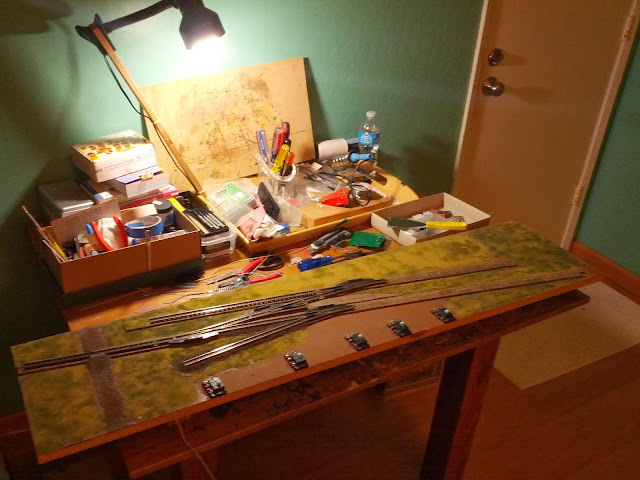 Tonight I cut the flex track to length, added an extra rail joiner for the sensor pickup (you can't solder wire directly to Maerklin's track), and glued everything in place. No kinks. Proper detection. 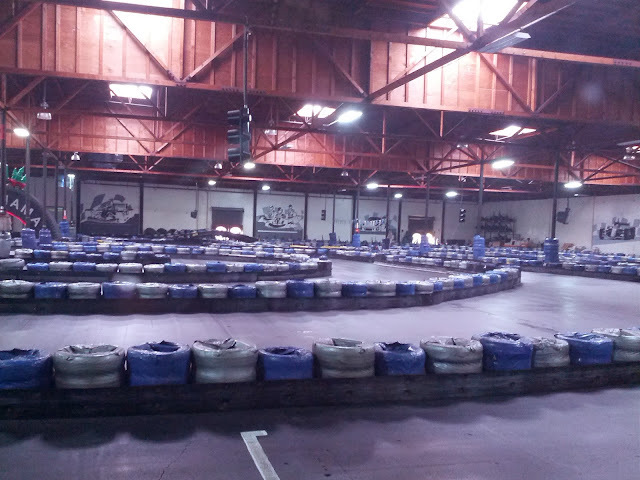 Better track flow. 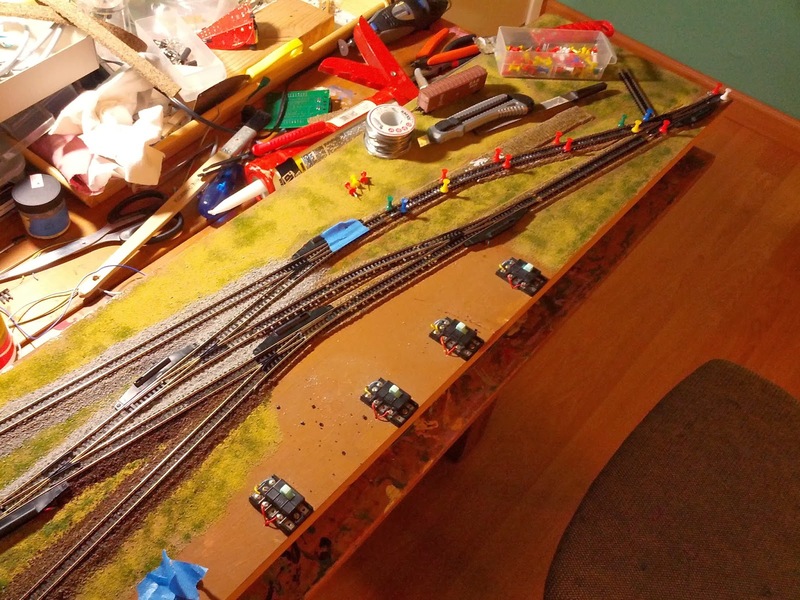 The glue is still wet, so I can't run a train through the track and test it out yet. I ran a train over the next track tonight, ... and the southern section of Track 1 now no longer has power. Great. Apparently the flextrack section was powered from the end that I removed.